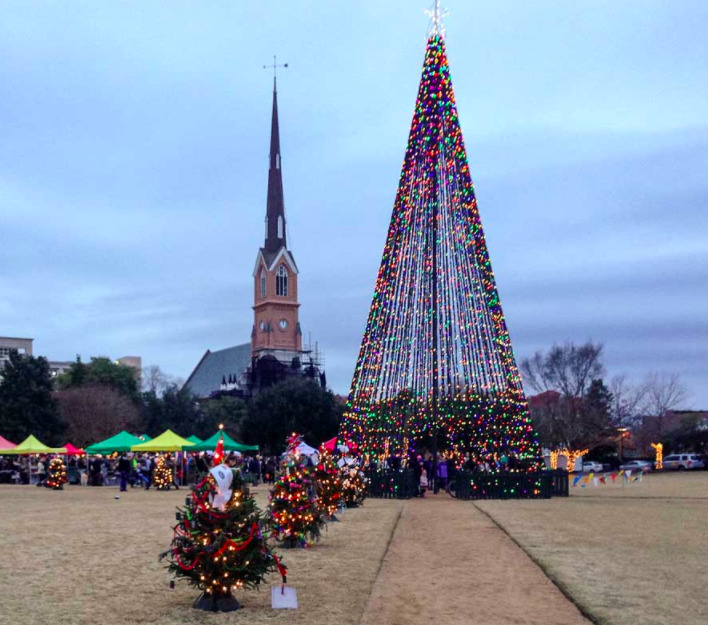 This weekend marks that special time when Marion Square transforms into a winter wonderland and that means we say goodbye to the regular season of the Charleston Farmer's Market... and hello Holiday Magic in Historic Charleston. Over the last 25 years, the farmer’s market offerings have progressed from more than just summer melons to a true year-round assortment of the best that local growers, tenders, cultivars, and artisans have to offer--much like markets of yesteryear. As the function of the local marketplace seems to have come full-circle, we thought it’d be interesting to look at how peninsular residents got their fresh-caught, just-picked, hand-made goods in the past. Vendors used wooden stalls at the original Beef Market until a brick building was constructed in 1739; this was replaced by another brick structure in 1760. 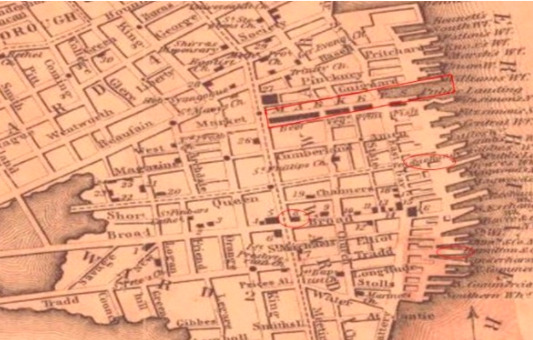 The great fire of 1796 destroyed the Beef Market, and it was not rebuilt. The land was instead sold to First Bank of the United States, for whom Gabriel Manigault designed the building that we currently know as our own City Hall. The grand Fish Market that had been erected in 1797 was partly destroyed in the hurricane of 1804 and was closed a few years later; the area became a wharf used by fisherman into the latter half of the 20th century and none of the original Fish Market remains. 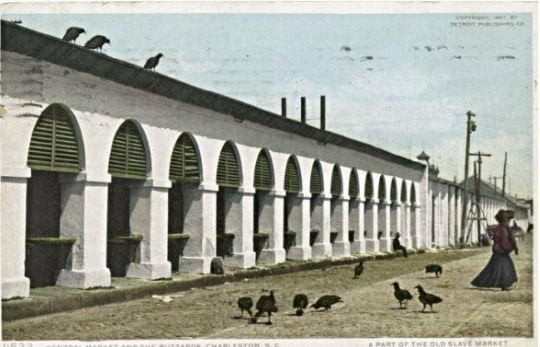 The Tradd Street market included a wharf where farmers could land produce and animals; six stalls in the market were reserved for “planters that bring or send their own flock to market, suggesting that live animals were sold here as well. This market, too, was subjected to fire and foul weather and also eventually closed. Remember a few years ago when there was an archeological dig on East Bay and South Adger’s Wharf? That was the Mayor’s Walled City Task Force, who uncovered lots of interesting finds from the former “Lower Market” site. 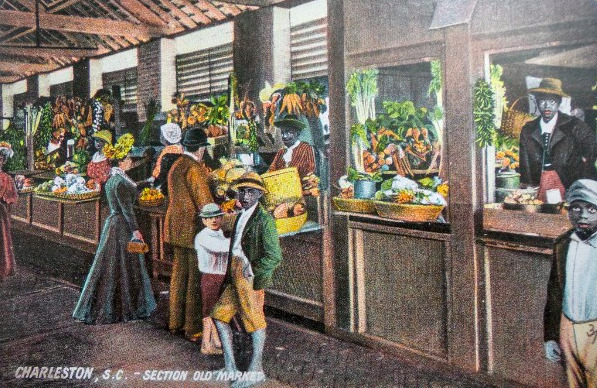 The Market was the center of commerce for Charleston’s victuals throughout the 19th century and most of the 20th century, but downtown residents always had another reliable resource for fish, shrimp, vegetables, flowers, and just about anything else. 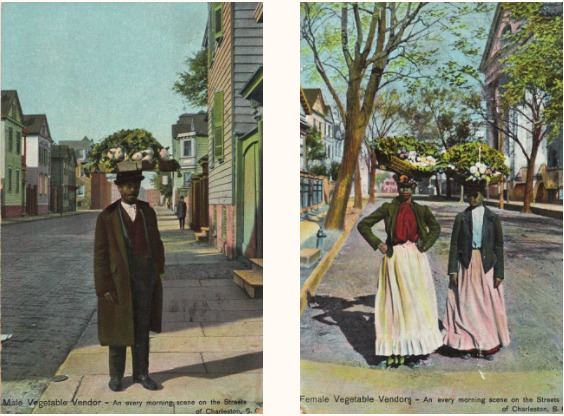 While huckstering and peddling was common in 18th and 19th century cities, Charleston’s street vendors were different: slaves or freedmen, they were all of African descent. The melodious Gullah peddler cries heard in the streets of Charleston were noted by visitors and often praised and studied by locals. 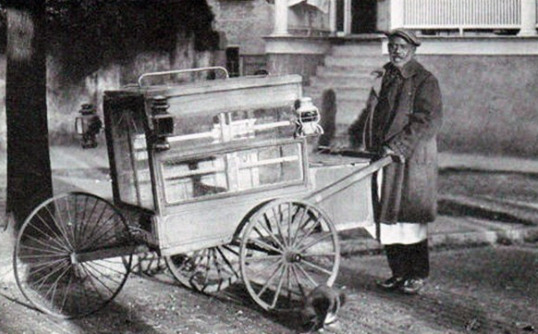 One of Charleston’s most famous early street vendors was “Old Daddy California Tom,” who peddled watermelons downtown before the Civil War from an old “delapidate” cart. A city institution, he was called California Tom because “popular superstition had it that his melons came from California [!] and his song was a melodious refrain worded thus: Fresh and fine, Just from the vine, California watermelons, Come in time, winding up with Barcalingo, water melon--Barcalingo, water melon.” (News & Courier, 08/14/1873) Looks like California held some sort of glam, even back then. Joe was remembered for his cry, “Porgy walk, Porgy talk, Porgy eat with a knife and fork.” In an article from as late as 1957 lamenting “The Vanishing Huckster,” Joe is remembered: “Gone is Joe Cole, a tremendous reddish skinned [African American] with a magnificent voice worthy, some said, of grand opera. Joe sold crabs accompanied by his dog Jeff Davis, and his beautiful voice was known all over town, as was his evil reputation.” Uh-oh. What’s up, Joe? The article quoted above from 1873, after describing the street cries of many vendors, ends with the sentence, “They are as perpetual as the eternal hills, and will last as long as Charleston has a name and existence.” Well, that’s not quite true, now is it? Newspaper articles over the years during the 1900s variously praise the Charleston street criers or complain about them: “In selling shrimps it appears that no regard is paid to the law respecting the hours when hawking about the streets is permitted and the rest and quiet of three-fourths of the residents of the city are ruthlessly disturbed every day. The...vendors begin their crying before 6 o’clock in the morning and when a number of them get together they attempt to howl one another down, awakening the taxpayers at the time when sleep is sweetest.” (Evening Post, 09/28/1899) Okay, six o’clock in the morning? Valid point. For those of us too young to have heard the melodious street cries of Charleston, there are a couple of opportunities to heighten your imagination to what they were like. You can listen to the The Spiritual Society's "Field Recordings, 1936-39" CD that includes recordings of the champion street criers from the 1936 Azalea Festival. As far as experiencing anything close to the old City Market, where residents gathered to socialize and not buying local wasn’t an option? Well, the Charleston Farmer’s Market on Marion Square is the closest thing we’ve got. And, like we said, December 2nd is the first day of the holiday market season. So, we’ll see y’all there? 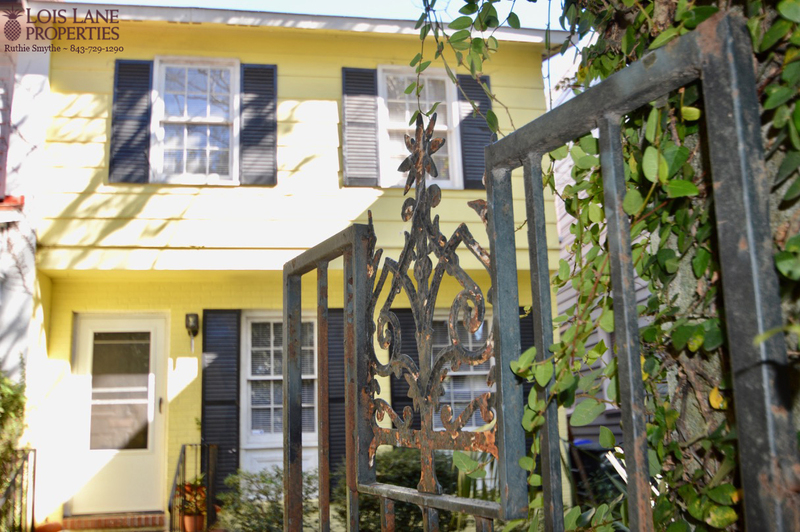 And... if you happen to be out and about this holiday season check out Ruthie's new listing located just blocks away from Marion Square and King Street restaurants and shopping. This three bedroom townhouse is perfect for a first time homebuyer or retiree. Living room, separate dining room opening into kitchen and half bath downstairs. Large brick fence surrounds big front yard for privacy. Backyard and side yard gives plenty of outdoor space. And the best part? The Charleston Farmer's Market is only a short walk away. If you (or someone you know) have people coming to town for the holiday season but you don’t have the space (or perhaps they want their privacy), Ginger has an amazing fully furnished two bedroom penthouse apartment available to rent for the month of December & January. 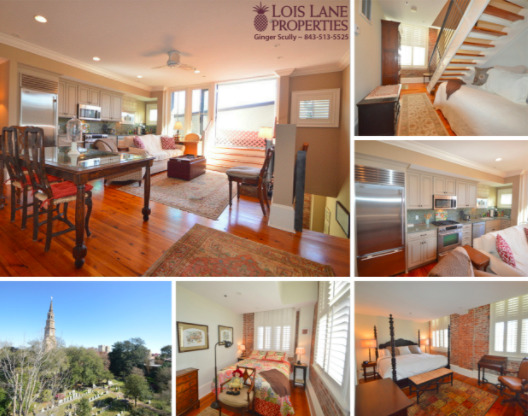 This furnished condo on including utilities, wifi and cable television, has all the amenities a person could need, while being steps away from Charleston dining, galleries, shopping and theater. One garage parking space is included plus additional residential parking on the street. 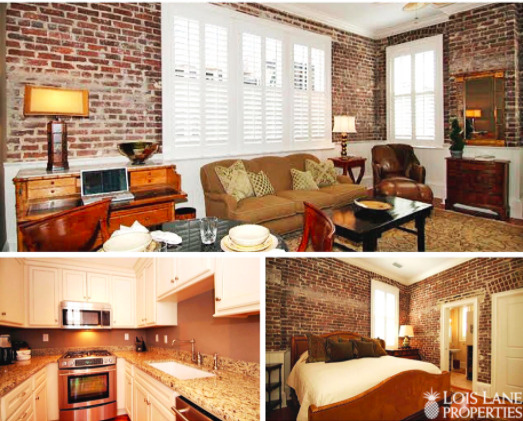 Ginger also has a stylish fully furnished one bedroom condo for rent in the French Quarter. This can be a holiday rental or longer term. The home features high ceilings, exposed brick, large windows, granite counter tops, custom cabinetry, heart pine floors, high-end stainless steel appliances, and a stone tiled bathroom. Located in a secure building with an elevator, this home-away-from home includes a walk-in closet and large bathroom. If interested in either of these properties, give Ginger Scully a call at (843) 513-5525 and be home for the holidays!